Pure cane syrup is a thick, amber-colored syrup made from the juice extracted from the sugar cane plant. It is a popular ingredient in desserts and candies as well as in many Creole and Caribbean dishes. White granulated sugar is also made from sugar cane juice, making it a natural substitution for cane syrup. To substitute sugar for cane syrup, you first have to make a sugar syrup (also called simple syrup). Mix the sugar and the water in your saucepan. Heat the ingredients over medium heat, stirring occasionally to help the sugar dissolve in the water. You want all the sugar to dissolve before the solution begins to boil. Wipe down the sides of the pot with a pastry brush if the sugar sticks to the sides. Bring the mixture to a steady boil. Once boiling, cook for approximately five minutes or until enough water has evaporated that the solution thickens and begins to take on a syrupy texture. Do not stir the syrup once it begins to boil. Doing so can interrupt the molecular exchange occurring between the water and the sugar and will cause the sugar molecules to clump up and crystallize. If this begins to happen, add a drop of lemon juice. If clumping does not stop, it is best to start over. Cook the syrup until it reaches 245 degrees Fahrenheit. Plug your sink and fill it with cool tap water. Remove your saucepan from the heat and set it into the sink to allow the pan to cool and the syrup to stop cooking. Add the same volume of sugar syrup as the amount of cane syrup called for in the recipe to your dish. Maintain a ratio of two parts sugar for every one part water to make sugar syrup in any amount. 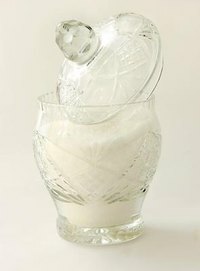 Store extra sugar syrup in a glass bottle or glass container for two weeks in the refrigerator. In addition to lemon juice, you can use a few drops of cream of tartar or corn syrup to stop the crystallization process.